(Ref:RG010) Roda Golf villa with wow factor. This Roda Golf villa is South facing and enjoys outstanding views across the golf course and really is in a fabulous location. Located on Phase 3B in a very secluded and exclusive part of Roda Golf, we have this beautiful detached... See details & gallery for this Villa! (Ref:RG061) Fantastic new Roda Golf villas. Have some design input on these amazing new front line Roda Golf villas with private pool. 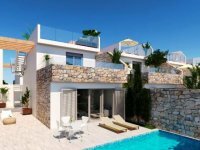 Roda Golf villa, individually designed with 3 bedrooms and private swimming pool The new villa plots are in very good... See details & gallery for this Villa!